If you have a horse farm, you will undoubtedly be in need of a sturdy, quality horse fence. Horse fences are designed not only to protect your horses from anyone wishing to do them harm, but also to protect the investment that you made in your horse. 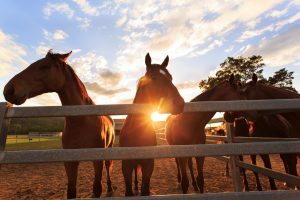 While horse fences are practical and designed to serve a specific purpose (keeping horses in your yard), that doesn’t mean that they can’t be beautiful to look at. Here is what you need to know about choosing materials for your horse fence. Wood is a traditional choice for every type of fencing, including horse fences. Wood fences look traditional and right at home on the farm. Wood horse fences are particularly common because they are strong and sturdy. Wood horse fences also last a great deal of time with the proper care and maintenance and can be stained or painted to match your home and landscaping. Polyvinyl horse fencing is growing in popularity because it provides the look of wood at a more modest price. Polyvinyl fencing is made of hollow rails that connect by snapping into place, so the installation process is smooth and seamless. Just like wood fencing, polyvinyl fencing can be purchased in a wide range of colors and styles to match your landscaping and hardscaping. Polyvinyl fencing is becoming more popular as a type of horse fencing partially because of its low maintenance requirements. Unlike wood fencing, polyvinyl fencing is virtually maintenance free. Wood horse fences will, at minimum, require seasonal maintenance and annual staining and repainting. If you have a large yard or property where your horses live, polyvinyl fencing will be much less expensive to install along the length of the property. This entry was posted on Friday, October 13th, 2017 at 11:02 am. Both comments and pings are currently closed.